Cost: $5 per person, 12 and under are free. 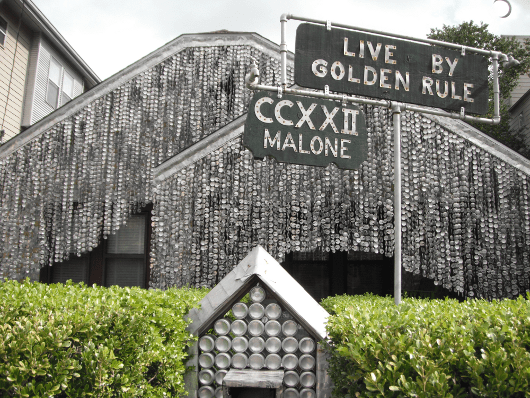 The Beer Can House is located at 222 Malone Street, between Memorial Drive and Washington Avenue. When you drive up, you think you’re in just any residential neighborhood until you see a shiny silver house with beer can chimes blowing in the wind. This house belonged to John Milkovisch who was a retired upholsterer for the Southern Pacific Railroad. He was tired of mowing the grass, so in 1968 he started creating “art” by adding marbles and rocks to concrete and making unique lawn ornaments. When the yard was full, he started to cover the house in beer can siding. Over 18 years, John added over 50,000 cans to his house. The Beer Can House is open Saturday and Sunday, Noon – 5:00pm. (The hours/price have changed over the years… so check before you go!) We went on a Saturday at 12:00. The house was easy to find, and there was plenty of parking on the residential street. 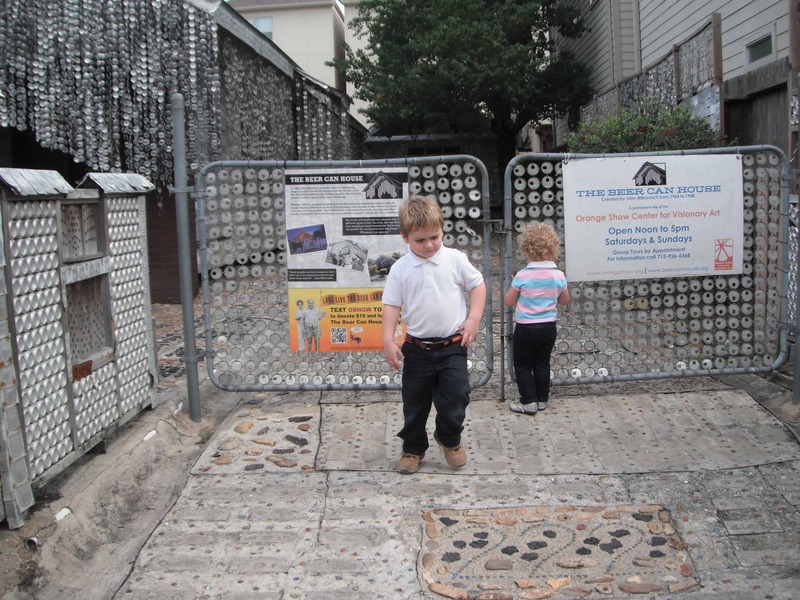 You can look at the house from the street for free (and day of the week) or you can get a closer look and support the restoration of the Beer Can House by paying $5 (for those older than 12). Joe’s favorite part was the concrete full of marbles. I kept pointing out the wind chimes and silver house, but he could not take his eyes off the sidewalk. To get a good idea of what there is to see, check out the YouTube video we found. The Beer Can House visit only took us about 20 minutes, but it was a fun little outing. It is cheap and entertaining, so we suggest you check it out. I can’t say I’m inspired to cover my house in beer cans… but if we ever need to replace some concrete, you can bet the new slab will be covered with marbles.